Health Warrior Chia Bar: Did you know this is the only bar with chia as the #1 ingredient? Now, you do. 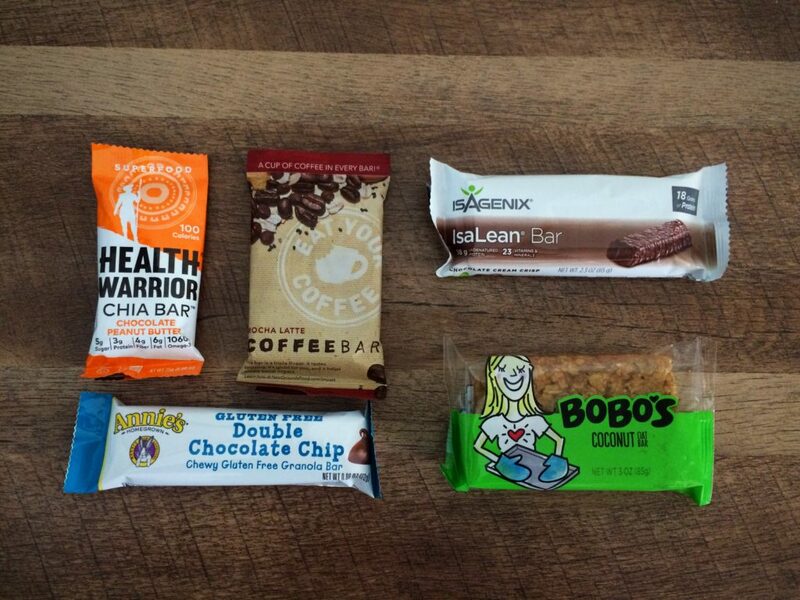 These bars have become the perfect fuel for the long run but they can serve as a pretty good afternoon snack too. You usually can’t go wrong with a chocolate peanut butter combo and with only 5g of sugar and 100 calories – I’ll give these a snack classification. On another note, the company story is amazing — inspired by Born to Run and the Tarahumara the company is making inspiration go full circle. Check this out! Eat Your Coffee – Mocha Latte: Raise your hand if you love coffee. It’s one of those things that we often say we can’t get enough of. What if I told you that you can now eat your coffee too..? If your favorite energy bar and coffee had a baby — coffee infused bars. A-maz-ing. You know what else is amazing, the company was founded by two coffee deprived Northeastern students [I can relate, I was once in their shoes too]. 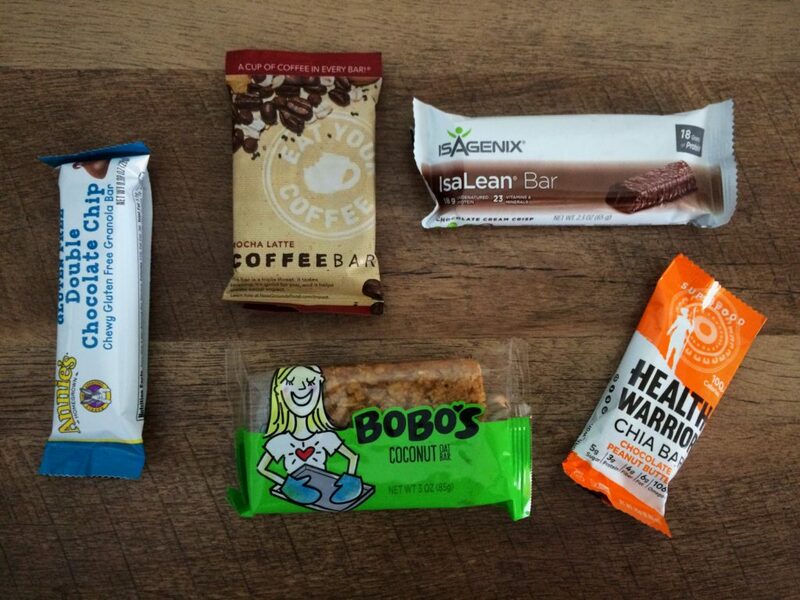 Try these energizing bars out for all of life’s adventures. Remember no synthetic caffeine here and they are organic, vegan and gluten free. IsaLean Bar – Chocolate Cream Crisp: Remember, there is a difference between a snack bar and a meal bar. I’ll call this a meal bar. For a snack, divide it into two servings. This bar has 18 grams of protein, so it satisfies hunger when you are on the go. These are a staple in our house for busy travel schedules – this is our version of fast food. And, for those of you with a sweet tooth, reach for this instead of a candy bar – it’s delicious! [You will probably love a Dairy Free favorite too – Chocolate Coconut Almond – think, Almond Joy]. Bobo’s Coconut Oat Bar: I love these bars. The right amount of soft and chewy, the right amount of coconut, the right amount of fullness. Started as a Mom and Daughter afternoon baking activity, the bar, with no compromise to the original recipe, is now on shelves nationwide and frequents our pantry. It has a 4 ingredient base, offers two servings per bar and is simply, delicious. Annie’s Double Chocolate Chip: We are big believers of learning the importance of making good food choices at a young age. Now, this is not to say that we don’t support having a snack now and then, we just look for the healthIER snack options [not as easy as you may think — but, entirely possible]. These bars meet the standard – lower in sugar than many competitors, with a focus on real ingredients and sustainable farming practices, Annie’s fits the needs of the littlest one in our house [parent approved, first]. So, taste test for yourself. If you try a bar from the list, let us know what you think. Or maybe you have a favorite that’s not listed here — if so, please share. Is the bar a meal or a snack? When will you eat this bar? Post workout? Lunch? All the time? Does the bar have a handful of ingredients or 50+?